This fact sheet provides an overview of the Medicare Part D program, plan availability, enrollment, and spending and financing, based on data from the Centers for Medicare & Medicaid Services (CMS), CBO, and other sources. In 2019, 901 PDPs will be offered across the 34 PDP regions nationwide (excluding the territories). This represents an increase of 119 PDPs from 2018 and the second year in a row with an increase, after three years of plan reductions (Figure 1). The relatively large increase in the number of PDPs is likely due to the recent elimination by CMS of the “meaningful difference” requirement for enhanced benefit PDPs offered by the same organization in the same region. Plans with enhanced benefits can offer a lower deductible, reduced cost sharing, and/or a higher initial coverage limit. Previously, PDP sponsors were required to demonstrate that their enhanced PDPs were meaningfully different in terms of enrollee out-of-pocket costs in order to ensure that plan offerings were more distinct. Between 2018 and 2019, the number of enhanced PDPs will increase from 421 to 553, largely due to this policy change. Beneficiaries in each state will have a choice of multiple stand-alone PDPs in 2019, ranging from 22 PDPs in Alaska to 30 PDPs in the Pennsylvania/West Virginia PDP region (see map). In addition, beneficiaries will be able to choose among multiple MA-PDs offered at the local level for coverage of their Medicare benefits, including prescription drugs. Beneficiaries with low incomes and modest assets are eligible for assistance with Part D plan premiums and cost sharing. Through the Part D Low-Income Subsidy (LIS) program, additional premium and cost-sharing assistance is available for Part D enrollees with low incomes (less than 150% of poverty, or $18,210 for individuals/$24,690 for married couples in 2018) and modest assets (less than $14,100 for individuals/$28,150 for couples in 2018). 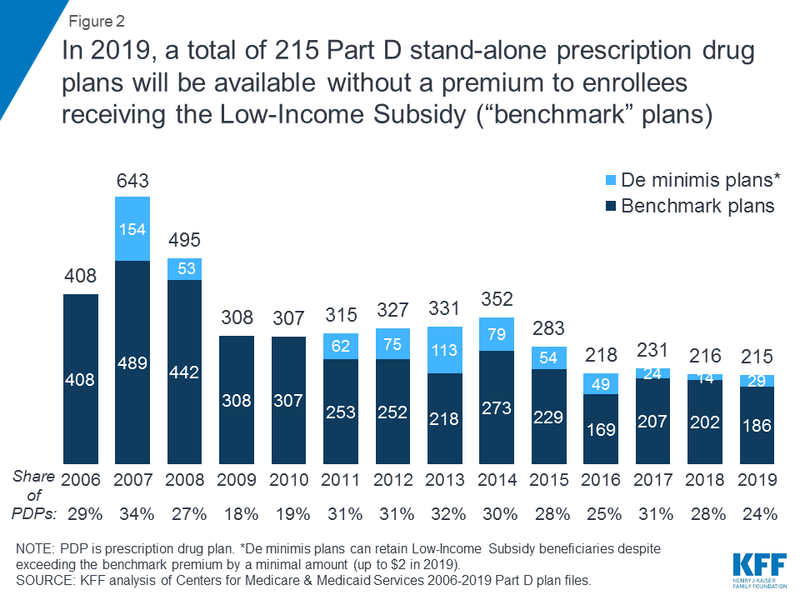 In 2019, 215 plans will be available for enrollment of LIS beneficiaries for no premium, one less than in 2018, and the lowest number of benchmark plans available since the start of the Part D program in 2006 (Figure 2). Just under one-fourth of PDPs in 2019 (24%) are benchmark plans. All LIS enrollees can select any plan offered in their area, but if they enroll in a non-benchmark plan, they must pay some portion of their chosen plan’s monthly premium. Some enrollees have fewer benchmark plan options than others, since benchmark plan availability varies at the Part D region level. The number of premium-free PDPs in 2019 ranging from a low of 2 plans in Florida to 10 plans in Arizona (see map). The 2019 Part D base beneficiary premium—which is based on bids submitted by both PDPs and MA-PDs—is $33.19, a 5% reduction from 2018. But actual premiums paid by Part D enrollees vary considerably from this amount. For 2019, PDP monthly premiums vary by plan across the country (and even within regions), ranging from a low of $10.40 for a PDP available in Texas to a high of $156 for a PDP in the Pennsylvania/West Virginia PDP region. In addition to the monthly premium, Part D enrollees with higher incomes ($85,000/individual; $170,000/couple) pay an income-related premium surcharge, ranging from $12.40 to $77.40 per month in 2019 (depending on income). Part D plans must offer either the defined standard benefit or an alternative equal in value (“actuarially equivalent”), and can also provide enhanced benefits. 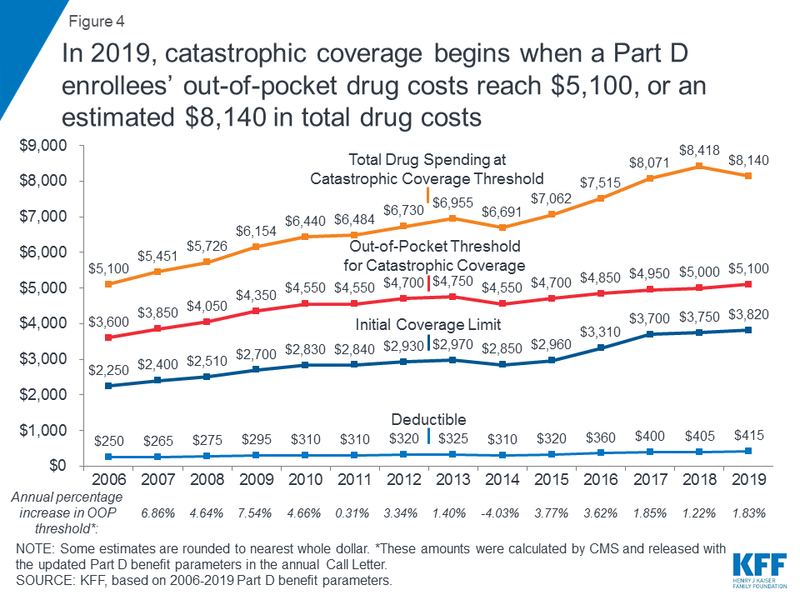 The 2019 Part D defined standard benefit has a $415 deductible and 25% coinsurance up to an initial coverage limit of $3,820 in total drug costs (Figure 3). For total drug costs above that amount, under changes made by the Bipartisan Budget Act of 2018 (BBA), Part D enrollees’ out-of-pocket costs for brands will be 25% in 2019 (down from 35% in 2018)—rather than in 2020—while plans’ share of costs for brands will be 5% and the manufacturer discount will be 70% (an increase from 50% prior to 2019). For generic drugs, enrollees will pay 37% coinsurance and plans will pay 63%. This allocation of costs for brands and generics in the coverage gap applies until an enrollee’s total out-of-pocket spending reaches $5,100, the out-of-pocket threshold for catastrophic coverage in 2019. 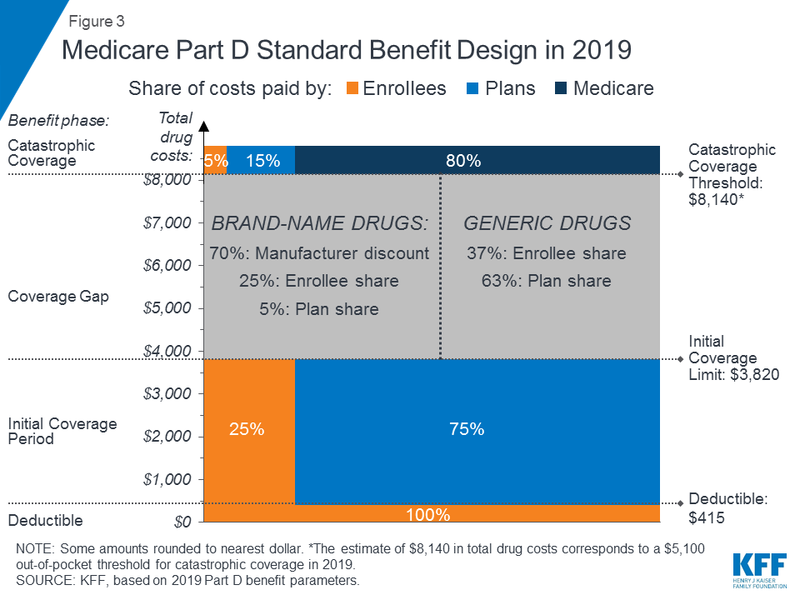 For total drug costs above the catastrophic threshold, Medicare pays 80%, plans pay 15%, and enrollees pay either 5% of total drug costs or $3.40/$8.50 for each generic and brand-name drug, respectively. The standard benefit amounts are indexed to change annually based on the rate of Part D per capita spending growth, and, with the exception of 2014, have increased each year since 2006 (Figure 4). Both basic and enhanced plans vary in terms of their specific benefit design, coverage, and costs, including deductibles, cost-sharing amounts, utilization management tools (i.e., prior authorization, quantity limits, and step therapy), and formularies (i.e., covered drugs). Plan formularies must include drug classes covering all disease states, and a minimum of two chemically distinct drugs in each class. Part D plans are required to cover all drugs in six so-called “protected” classes: immunosuppressants, antidepressants, antipsychotics, anticonvulsants, antiretrovirals, and antineoplastics. In 2019, most PDPs (71%) will charge a deductible, but only half (52%) of PDPs will charge the full amount ($415). Over time, Part D plans have shifted to charging tiered copayments or coinsurance amounts for covered drugs rather than a uniform 25% coinsurance rate, and nearly all plans use specialty tiers for high-cost medications. Enrollment in Medicare Part D plans is voluntary, with the exception of beneficiaries who are eligible for both Medicare and Medicaid and certain other low-income beneficiaries who are automatically enrolled in a PDP if they do not choose a plan on their own. Unless beneficiaries have drug coverage from another source that is at least as good as standard Part D coverage (“creditable coverage”), they face a penalty equal to 1% of the national average premium for each month they delay enrollment. In 2018, 43 million Medicare beneficiaries are enrolled in Medicare Part D plans, including employer-only group plans. Another 1.5 million beneficiaries are estimated to have drug coverage through employer-sponsored retiree plans where the employer receives subsidies equal to 28% of drug expenses between $415 and $8,500 per retiree (in 2019). Several million beneficiaries are estimated to have other sources of drug coverage, including employer plans for active workers, FEHBP, TRICARE, and Veterans Affairs (VA). Yet 12% of people with Medicare are estimated to lack creditable drug coverage. An estimated 13 million Part D enrollees receive the Low-Income Subsidy in 2018. Beneficiaries who are dually eligible, QMBs, SLMBs, QIs, and SSI-onlys automatically qualify for the additional assistance, and Medicare automatically enrolls them into PDPs with premiums at or below the regional average (the Low-Income Subsidy benchmark) if they do not choose a plan on their own. Other beneficiaries are subject to both an income and asset test and need to apply for the Low-Income Subsidy through either the Social Security Administration or Medicaid. The Congressional Budget Office (CBO) estimates that spending on Part D benefits will total $99 billion in 2019, representing 15% of net Medicare outlays (net of offsetting receipts from premiums and state transfers). Part D spending depends on several factors, including the number of Part D enrollees, their health status and drug use, the number of enrollees receiving the Low-Income Subsidy, and plans’ ability to negotiate discounts (rebates) with drug companies and preferred pricing arrangements with pharmacies, and manage use (e.g., promoting use of generic drugs, prior authorization, step therapy, quantity limits, and mail order). Federal law prohibits the Secretary of Health and Human Services from interfering in drug price negotiations between Part D plan sponsors and drug manufacturers. Financing for Part D comes from general revenues (73%), beneficiary premiums (15%), and state contributions (11%). The monthly premium paid by enrollees is set to cover 25.5% of the cost of standard drug coverage. Medicare subsidizes the remaining 74.5%, based on bids submitted by plans for their expected benefit payments. Higher-income Part D enrollees pay a larger share of standard Part D costs, ranging from 35% to 85%, depending on income. For 2019, Medicare’s actuaries estimate that Part D plans will receive direct subsidy payments averaging $296 per enrollee overall and $2,337 for enrollees receiving the LIS; employers are expected to receive, on average, $553 for retirees in employer-subsidy plans. Part D plans’ potential total losses or gains are limited by risk-sharing arrangements with the federal government (“risk corridors”). Plans also receive additional risk-adjusted payments based on the health status of their enrollees and reinsurance payments for very high-cost enrollees. Under reinsurance, Medicare subsidizes 80% of total drug spending incurred by Part D enrollees above the catastrophic coverage threshold (Figure 3). For 2019, average reinsurance payments per enrollee are estimated to be $936, a 6% increase from the 2018 estimate. 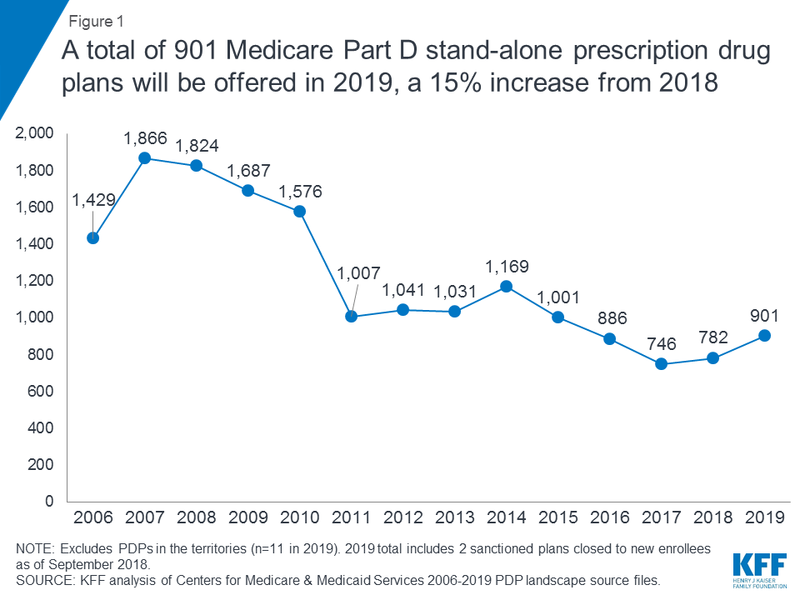 In the aggregate, Medicare’s reinsurance payments to plans have grown from $6 billion in 2006 to an estimated $43 billion in 2019, accounting for a larger share of total Part D spending over time (from 14% in 2006 to an estimated 42% in 20191). This increase is due in part to a growing number of Part D enrollees with spending above the catastrophic threshold, which is a result of several factors, including the introduction of high-cost specialty drugs, increases in the cost of prescriptions, and a change made by the ACA to count a manufacturer discount on the price of brand-name drugs in the coverage gap towards the out-of-pocket threshold for catastrophic coverage. 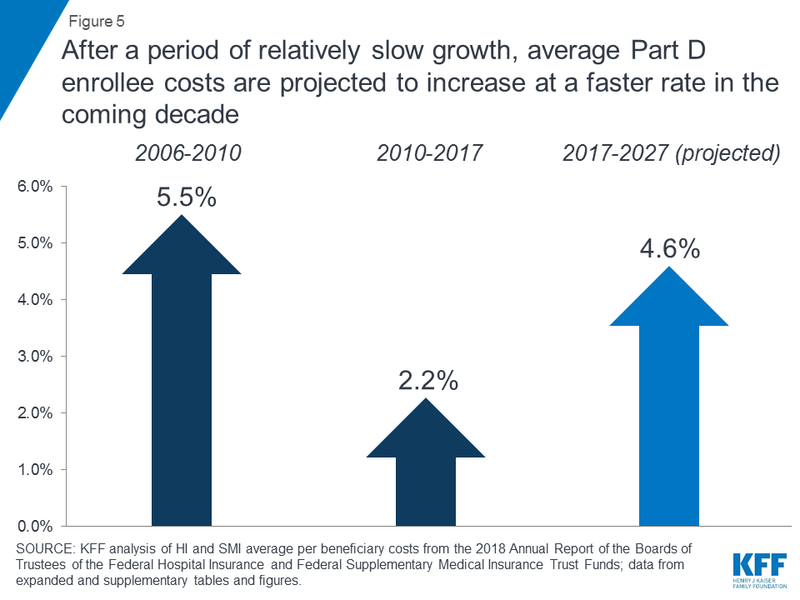 Analysis from MedPAC also suggests that in recent years, plans have underestimated their enrollees’ expected costs above the catastrophic coverage threshold, resulting in higher reinsurance payments from Medicare to plans over time. The Medicare drug benefit helps to reduce out-of-pocket drug spending for enrollees, which is especially important to those with modest incomes or very high drug costs. Closing the coverage gap will bring additional relief to millions of enrollees with high costs. But with drug prices on the rise and more plans charging coinsurance rather than flat copayments for covered brand-name drugs, Part D enrollees could face higher out-of-pocket costs for their medications. These trends highlight the importance of comparing plans during the annual open enrollment period. Research shows, however, that relatively few people on Medicare have used the annual opportunity to switch Part D plans voluntarily—even though those who do switch often lower their out-of-pocket costs as a result of changing plans. Understanding how well Part D is meeting the needs of people on Medicare will be informed by ongoing monitoring of the Part D plan marketplace, assessing coverage and costs for high-cost biologics and other specialty drugs, and evaluating the impact of the drug benefit on Medicare beneficiaries’ out-of-pocket spending and health outcomes. KFF analysis of aggregate Part D reimbursement amounts from Table IV.B10, 2018 Annual Report of the Boards of Trustees of the Federal Hospital Insurance and Federal Supplementary Medical Insurance Trust Funds. KFF analysis of Part D benefits spending as a share of net Medicare outlays (total mandatory and discretionary outlays minus offsetting receipts) from CBO, Medicare-Congressional Budget Office’s April 2018 Baseline.